Not only is this meal delicious, it’s also incredibly healthy. A tangy herb paste coats both the fish and zucchini, which roast in the same pan. The entire meal is ready in 30 minutes – perfect for busy weekday dinners. Throw the scallions, cilantro, mint, oil, ginger, coriander and 1/2 teaspoon salt into a food processor and pulse until a coarse paste forms. Season with pepper. Toss the zucchini with 3 tablespoons of the herb paste in a bowl. Spread onto a rimmed baking sheet. Roast for 5 minutes. Rub the remaining herb paste onto both sides of fish fillets. Push the zucchini to the edges of the baking sheet and arrange the fish in the center, leaving about 1/2 inch between each fillet. Roast until the fish is opaque and semi-firm to the touch, about 15 minutes. Meanwhile, prepare the couscous. Serve the fish and zucchini over the couscous. Lisa R. Young, Ph.D., R.D. shared her favorite food fact in her book, “The Portion Teller Plan”: you can lose 10lbs a year by cutting 100 calories a day. To do this, simply trim your portions. Choose a 12oz beverage instead of a 20oz. Eat only half of an energy bar. Use one tablespoon of salad dressing instead of two. Eat half of a sandwich instead of the whole thing. Eat a prepackaged bag of pretzels instead of eating out of a large bag. Order a tall drink instead of a grande at your next Starbucks visit. There’s nothing better than a warm bowl of soup on a chilly fall day. This soup contains kale, a superfood that’s packed with vitamins, minerals and cancer-fighting enzymes. It contains loads of vitamin A, vitamin C, B6, manganese, calcium, copper and potassium. In your soup pot, heat the olive oil over medium heat. Add the onion and garlic and cook for 5 minutes. Add the cooked beans, water, bouillon, salt, pepper, bay leaves, rosemary and carrots. Simmer for 15-20 minutes. Add the kale and cook another 15 minutes or until kale is tender. Add more water if needed. Nutritional Analysis: One serving equals: 112 calories, 2g fat, 20g carbohydrate, 7.3g fiber, and 6g protein. 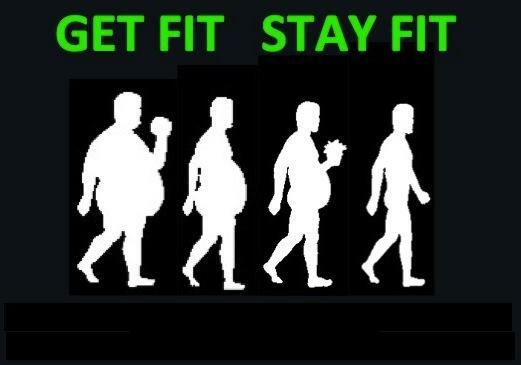 Lots of people ask me how to get fit quickly and easily. While I know they’re hoping for a simple answer, the reality is that getting and staying fit is a lifestyle, not a quick fix. Rid your home of chips, cookies, candy, baked goods, pre-packaged snacks and anything else that belongs in a vending machine. Replace it with fresh fruit, veggies, nuts and other whole-food snacks. Fit people make exercise a priority. Along with keeping a job, paying the bills and going to the doctor, exercise is an important part of their lives. What I’ve found is that fit people put exercise before leisure time. Sure, fit people enjoy leisure, but it’s scheduled around their workout time. Treat exercise time with the same importance that you would a business meeting or trip to the dentist. Add your workouts to your calendar as an important event/meeting you can’t miss. Then treat it the same way and make the most out of your time at your workout. The next time you feel full, take it as a sign to stop eating — even if your plate isn’t empty. Not only do fit people make time to go to the gym, they challenge themselves during each workout. While it is easy to simply go through the motions, you’re cheating your body out of great results when you don’t push yourself. Exercise should make you sweat, make your muscles burn, and leave you with a feeling of accomplishment. Find ways to make each workout more challenging. For competitive people, the best way to push yourself is to exercise with a friend of similar strength. Another great way to challenge yourself is to set small, attainable goals. These goals could be to push heavier weight, to sprint longer, or to do cardio at a higher intensity setting. Fit people know that eating in front of the T.V. is mindless eating. When your attention is on your entertainment and not on your food, then you’ll be less tuned in to what and how much ends up in your mouth. Eating in front of the T.V. is also very habit-forming. Ever notice how you crave munchies simply as a reflex of sitting in front of the T.V.? Fit people drink lots of water — not just in addition to other beverages, but instead of them. Water is their main drink, while other drinks are occasional treats. Calorie-filled drinks are one of the quickest ways to consume excess calories, which quickly turn into fat. Consider water your beverage of choice. Drink 1/2 your body weight in ounces of water each day, and drink other beverages only a few times each week. Fit people don’t leave their motivation to chance. They know that if their personal trainer, boot camp instructor or workout partner is waiting for them, then they are less likely to skip a workout. It’s so easy to hit “snooze” or to talk yourself out of the gym as soon as your behind hits the couch after work. Fit people take the option of skipping out of the equation. If you already practice some of these habits, then congratulations – you’re on your way to a better body. Make an effort to incorporate the rest of the habits to take your results to the next level. If none (or very few) of these habits describe your lifestyle, then I’ve got good news – you now have 7 effective new habits to start that will get you some awesome results. Don’t try to tackle all 7 at once! Pick one or two to add each week and gradually work up to all 7. On the other hand, there are habits will result in weight gain faster than you can say “whoops, I’m fat again.” Break the following three habits quickly, or pay the price in tubbiness. Drinking Calories. Soda pop, coffee drinks, smoothies and fruit juices are filled with calories. Since liquids won’t give you a full feeling, the calories in these drinks slide to your hips unnoticed by your stomach. Stick with water to avoid extra calories. Spice things up by switching out your water with caffeine-free herbal tea (either iced or hot). Avoiding Exercise. Skipping the gym day after day, week after week, and month after month will lead to muscle loss and a reduced metabolism. Exercise 3-5 days per week to keep your muscles strong and metabolism high. Eating a Heavy Dinner. Eating a heavy dinner sets you up for weight gain. Instead of eating the majority of your calories late in the day, spread it out over the entire day.